A delightful tour offering a selection of attractions ranging from a vineyard to a Royal Borough a stunning garden and a stately home. A delightful tour offering a selection of attractions ranging from a vineyard to a Royal Borough and stunning gardens and a stately home. We depart from your home with our exclusive door to door pick up service and travel south to Berkshire with comfort stops enroute, arriving late afternoon, time to relax before dinner. For our first excursion we head for the picturesque Thameside town of Kingston-upon-Thames with its riverside setting, we have some time at leisure before we depart for the splendid Royal Horticultural Society Garden at Wisley. A place full of inspiration, Wisley offers ideas galore, with Wild Garden, Glasshouse, Modern Gardens, Fruit Field, Arboretum and spectacular floral displays.  on her honeymoon at Polesden Lacey. This country house with glorious views across the Surrey Hills, the glittering interior which was designed to impress Royalty the world over, houses art from the Dutch Masters and sparkling Faberge and much more, the gardens offer something for everyone. This morning we have a short drive taking in some of the lovely towns in the Thames region, including Maidenhead, Cookham, Bourne End and Marlow as we head for Henley-on-Thames, famous for its annual regatta. Henley is our lunch stop and this afternoon we end our day with a visit to Stanlake Park Vineyard and Winery near Twyford. We have a tour taking in all aspects of production and afterwards we get to sample a good selection of sparkling, white, rose and red  a good way to end our excursion. This morning after a leisurely breakfast we must bid farewell and begin our homeward journey with comfort stops enroute. · Admission RHS Wisley Garden. Located in the heart of Berkshire, our hotel is an ideal base and hotel facilities include indoor pool, spa, sauna and gym. All bedrooms have TV, telephone, hairdryer, tea/coffee making facilities, in fact everything you could want for a relaxing break. Beginning with our exclusive home pick-up service we travel south to Berkshire with comfort stops enroute, arriving late afternoon, time to relax before dinner. Today we travel through the rolling Surrey countryside to Guildford, the county town with its magnificent Cathedral and cobbled high street, there is time to explore the individual shops and obtain lunch. From here our final visit of the day is to stunning Polesden Lacey near Dorking, the late Queen Mother remarked 'This is a nice House …' on her honeymoon at Polesden Lacey. This country house with glorious views across the Surrey Hills, the glittering interior which was designed to impress Royalty the world over, houses art from the Dutch Masters and sparkling Faberge and much more, the gardens offer something for everyone. 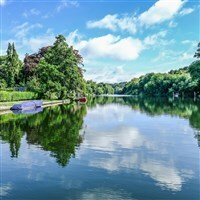 This morning we have a short drive taking in some of the lovely towns in the Thames region, including Maidenhead, Cookham, Bourne End and Marlow as we head for Henley-on-Thames, famous for its annual regatta. Henley is our lunch stop and this afternoon we end our day with a visit to Stanlake Park Vineyard and Winery near Twyford. We have a tour taking in all aspects of production and afterwards we get to sample a good selection of sparkling, white, rose and red - a good way to end our excursion.